Although the Google TV concept has so far met with a distinct lack of success, but the search engine giant are diversifying tactics as they look to license content to stream cable style TV channels via the web. The report comes from The Wall Street Journal, who report from inside sources that Google are in discussions with media companies about licensing content for an over-the-top linear streaming TV channel service, as opposed to an on-demand set-up like Netflix. 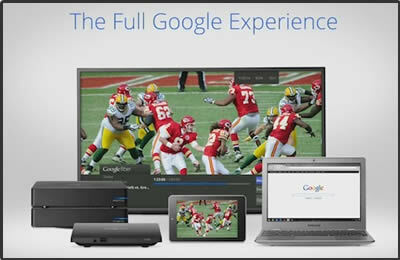 Google already have experience in the TV market after launching Google TV, and also it’s super high speed broadband service, Google Fiber for which they are already securing content. The report does not give any details about the companies approached but says they have demoed the product to programmers. Although Google have tried unsuccessfully negotiating with TV companies previously, the internet TV market has matured to a point where TV companies need to get involved as consumers head to the web for TV. The news comes soon after it was reported that Apple are in talks with TV companies along with Intel who are planning an internet streaming TV service via a set-top box called OnCue. Could Your Next Cable TV Supplier Be Google?